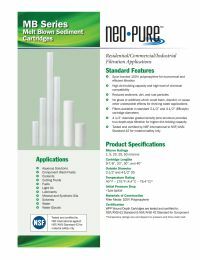 The Neo-Pure MB-25098-05 is a High Efficiency 9-7/8" Polypropylene Sediment Depth Filter, which is a reliable and economical solution for pre-filtration in many applications. The 9-7/8" sediment depth filter, like FCRO cartridges, offer greater surface area for longer life and greater dirt holding capacity. Neo-Pure MB-25098-05 filters are listed for food contact applications in Title 21 of the U.S. Code of Federal Regulations. NSF Certified The Neo-Pure MB-25098-05 has been tested and certified to NSF/ANSI Standard 42 for material safety components. 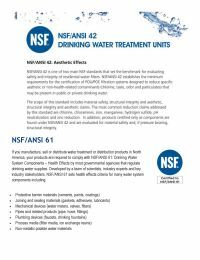 FDA Approved This filter is constructed with materials that are FDA CFR-21 approved for water that is filtered to a level that is safe and clean for cooking, bathing, and drinking. Popular reFresh Product Since you need RO replacement filters regularly, sign up for our reFresh program! Click here to learn more about the program, and how you can get all your replacement filters auto-shipped!